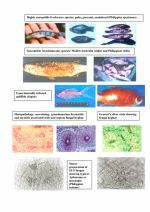 Hepatopancreatic microsporidiosis (HPM) caused by Enterocytozoon hepatopenaei (EHP) is a newly emerging disease of cultivated shrimp in Asia. Current evidence indicates that it can be associated with severe growth retardation that may not be clearly evident until the second month of culture and that it may even cause low continuous mortality in the case of very severe infections. Current production losses to HPM in Asia have been estimated to be in the range of tens to hundreds of millions of US dollars per year. Transmission to shrimp rearing ponds may come via post larvae (PL) used to stock ponds or via environmental sources such as live carriers or spores in water and sediments. Once transmitted to a pond, infected shrimp can spread the infection horizontally to other uninfected shrimp. The infected post larvae from hatcheries commonly arise by EHP transmission from broodstock, especially if they have been raised from PL derived from 1st-generation SPF stocks to be 2nd-generation broodstock in non-biosecure facilities. In addition SPF broodstock, free of EHP, may be contaminated by live feeds such as polychaetes and mollusks. To assist in controlling infections in broodstock and PL, PCR methods based on a gene encoding the small subunit ribosomal RNA (SSU-rRNA) gene of EHP (SSU-PCR) were developed for use in testing broodstock and PL and their live feeds for EHP infection. However, it was subsequently learned that the SSU-PCR methods cross reacted with SSU-rRNA gene sequences of closely related microsporidians (see below), making them useful for testing cultivated shrimp only and not for testing environmental samples. For this reason, a more specific PCR detection method was needed and details of its development follow. Due to the urgency in stemming losses to HPM, we have decided to release this method for free, non-commercial use to the global shrimp farming community. We believe that any delay in release of the new method will result in proportional losses to shrimp farmers and that this should be of paramount concern. By releasing the new method immediately, we hope that environmental reservoirs of EHP will be more quickly identified and control measures more speedily developed to block transmission. The benefits gained by the industry will far outweigh any derived from sale of intellectual property rights. Here we present a new method for detecting E. hepatopenaei that has superior specificity to the first generation SSU-PCR developed in 2009 when the genetic information of EHP was still limited. Feedback from users, particularly those in shrimp feed industry, indicated that the first generation method may yield false positive results for EHP with shrimp feed and/or feces of shrimp eating that feed. With broodstock feces, there is a danger that the broodstock may be deemed infected with EHP and discarded, or that positive feed or feed ingredients may be rejected by users, even though any microsporidian in the feed may have been killed during feed processing. Sequence comparison studies in our laboratories revealed that false positive results might result from cross reactivity of the SSU-rRNA primers with target DNA coding for SSU-rRNA from other microsporidia such as Hepatospora eriocheir and Enterospora canceri that infect crab and are the two most evolutionarily, closely related to EHP based on currently available sequences. Subsequent laboratory tests confirmed that such cross reactions can occur. Thus, we implemented an EHP genome project to identify EHP-specific genes that might be used to develop a new PCR diagnostic method to improve the specificity of the first generation SSU-PCR method. The second generation EHP detection method presented here is based on a gene encoding a spore wall protein (SWP) of EHP (SWP-PCR). Results from our laboratory work revealed, in contrast to SSU-PCR, that the SWP-PCR method did not give cross reactions with DNA from crabs infected with H. eriocheir and E. canceri. In addition, the SWP-PCR method had greater sensitivity than the SSU-PCR method with total DNA extracted from EHP-infected shrimp. For more detail please see an upcoming article by Jaroenlak et al. (preparing). From these results, we recommend that the new SWP-PCR method replace the first generation SSU-PCR method. However, this does not mean that results previously obtained by the SSU-PCR method are invalid if they have been obtained from cultivated shrimp, since there is no data to indicate that they develop HP infections caused by microsporidians other than EHP. However, tests that have previously given positive results for EHP using environmental samples such as water, feeds, sediments, suspected carriers, etc. should be re-confirmed using the SWP-PCR method. The sequences of the primers for the SWP-PCR method (nested PCR) are given below and can be used freely for non-commercial applications to detecting EHP. 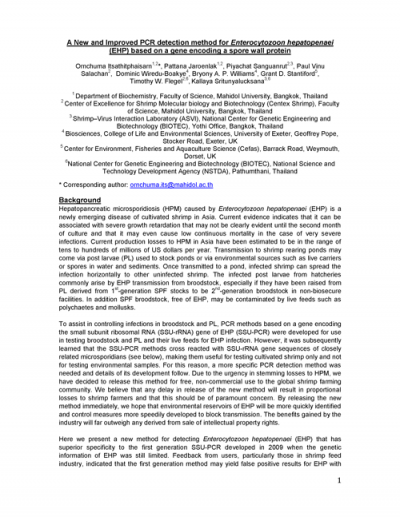 Please contact Centex Shrimp (ornchuma.its 'at' mahidol.ac.th) to obtain a free positive control plasmid (pGEM-EHPSWP). Similar to other nested PCR methods for diagnosing shrimp pathogens, the presence of the 514-bp amplicon after the first PCR indicates a heavy infection, while presence of only the smaller 148-bp nested amplicon indicates a light infection. We recommend that approximately 100 ng of total shrimp DNA be used in each assay.